1825 brought the completion of the Erie Canal, linking Albany, New York to Lake Erie and allowing goods to be transported more efficiently inland. The southern extension of the canal, which was referred to as the Beaver and Erie Canal, brought heightened involvement to Conneaut Lake, which until 1892 was known as Evansburg. In order to increase the water flow for the canal, Conneaut Lake was raised approximately 11 feet, submerging some of the land around the lake, and transforming peninsulas into islands along the west shore between Evansburg and the current location of Conneaut Lake Park. One of these islands came to be known as Wolf Island, on which there was an estate owned by renowned European engineer Thomas W. Kennard who was sent by James McHenry to oversee the construction of the Atlantic and Great Western Railroad in 1865. It would have been rare to actually find Kennard staying there, however, despite that he was entirely captivated by the natural beauty of Conneaut Lake. Having made some informal plans to build a hotel and a racetrack on the island, he recognized the potential of the area early on. He developed a somewhat romanticized attachment to the area and made the estate at Wolf Island his vacation home. Opposed to leaving the building vacant when he was away, a mysterious man who went by the name Phil Miller served as Kennard’s housekeeper, although it is said that Miller spent more time at Conneaut Lake than Kennard. Despite being a regular Sunday attendant at Methodist church in Evansburg, Miller’s character and background were often questioned by members of the community. 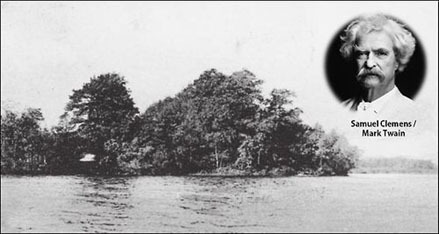 According to a memoir written by Bronson B. Luty titled The Lake as it Was, exaggerated rumors spread throughout the town that Miller was an ex-convict who had been locked up for murdering a man. One story says that Miller’s wife had brought a young girl, about ten years old, from Canada to stay with them at the residence until she mysteriously disappeared one day. Her body was later found in the reeds at the head of the lake. Whether or not these legends are true remains uncertain. What has been confirmed about Mr. Miller, however, is that he was an educated man with some very well-known friends. Perhaps the most famous of visitors to come to the estate was none other than renowned author Mark Twain, although his true identity had been kept secret from the community members by Miller at the time of his two week visit in 1879. Instead, he was introduced as Mr. Turner. With the completion of the railroad and the expiration of the usefulness of the canal system, however, Kennard was called back to England, and the lake was lowered back to its original level, robbing the island of much of its natural beauty. Today, Wolf Island is no longer an island, but the end of a peninsula. Driving north down the road along the west shore of the lake, you can easily spot the elevated ground that once served as the home to the infamous estate occupied by Phil Miller. The Conneaut Lake Our Town Team, “Wolf Island,” NW PA Heritage, accessed April 26, 2019, http://nwpaheritage.org/items/show/22.